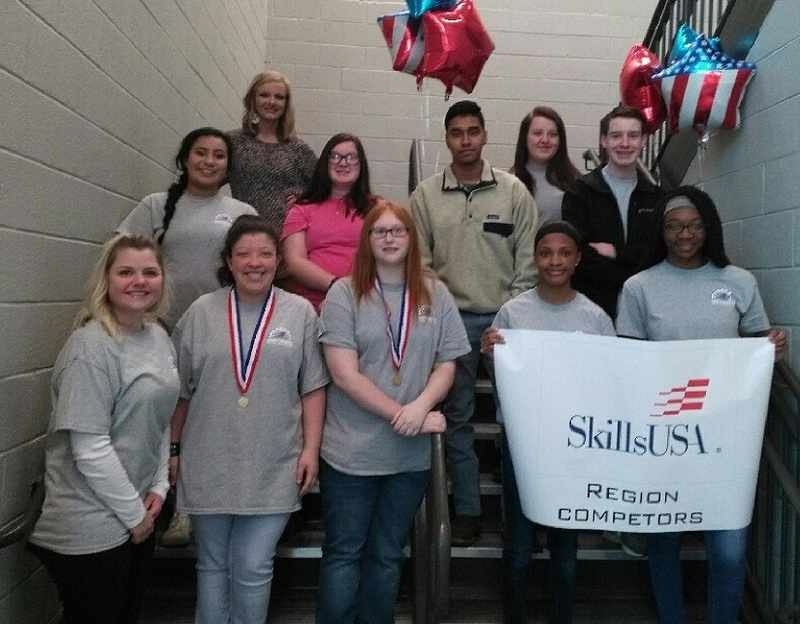 The SkillsUSA Region 2 Championships were held at North Georgia Tech in Clarkesville on Jan. 31 with students from Hart County High School taking an active part in the event. These championships offer students the opportunity to demonstrate their skills and be recognized for them through competitive activities in occupational areas and leadership. There were 33 schools represented at this completions. Hart County entered in several events and earned three first place awards, two second place awards and one third place award. Those bring home a first place award include Tesia Freeman in the T-Shirt Design category (Every member who attended received a t-shirt with Hart County’s winning design furnished by SkillsUSA); Harleigh Finley in the Architectural Drafting category; and David Galvin in the Auto Finishing category. Earning second place honors were Carter Hunt in the Technical Drafting category; and Janasia Gaines, Storrie Langston, Andrew Carlson and Kayla Ethridge in the Quiz Bowl category. Avery Miller took third place in the First Aid/CPR category. First and second place finishers move on to represent Hart County and North East Georgia at the State Conference in March in Atlanta. Ethan Sellers will also be advancing in HVAC. If interested in helping sponsor a student, please get in touch with any of the HCCS advisers, said adviser Vicky Carter. For additional information about HCHS SkillsUSA Team, please contact Vicky Carter at [email protected].